We have heard that a couple of the crews have run out of petrol on the rally. In Mongolia it was somewhat understandable as fuel was scarce and mostly from tankers in camp, and another crew has a broken fuel gauge so it can happen – but we have 100 litre capacity in 2 tanks and a perfectly serviceable fuel gauge so it would be less acceptable. 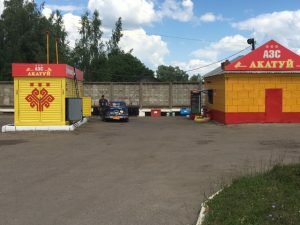 We are now in European Russia and fuel stops are frequent, except when we realise, having stopped to flip to the reserve tank, that we had already done that and we were running on fumes. The next fuel stops marked in the route book was 50km away and we were not on the main road. Any quality issues with searching out Gazprom or some other known brand of fuel were ignored as we luckily happened across this tiny fuel stop (pumps tucked away in a cupboard). As the only customer on a quiet road our 100 litre purchase was well received – on both sides.